On Thursday, the Wall Street Journal Online published a column by Carl Bialik, The Numbers Guy, called "Grading Weather Forecasts". It was about what I do here at ForecastAdvisor. Thank you everyone for all the positive comments and suggestions that I have recieved from people who have read the article and have tried ForecastAdvisor. In the article, Dr. Bruce Rose, Vice President and Principal Scientist for weather systems at The Weather Channel, stated in the article that July and August are the easiest months to forecast for temperature, with February the toughest. He's right, but I wanted to expand on that comment. 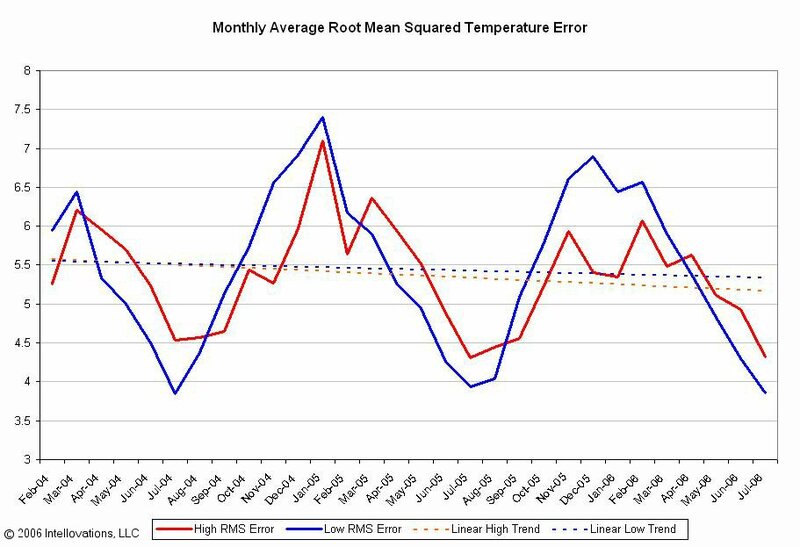 The graph below shows high and low temperature error by month for all forecasters ForecastWatch tracks. The error measurement used is what's called "RMS error", or "root-mean-squared error." This error measurement takes the error value (forecasted temperature minus actual temperature) and squares it. This makes all error values positive, and also penalizes forecasts that are way off much more than forecasts that are close. A forecast 10 degrees off is given an error four times one that is 5 degrees off, rather than just two times if the error value was not squared. All the squared errors are then averaged and the square root is taken, so that the unit value of error is still degrees. In the graph below, each month's data point is the aggregation of about 600,000 forecasts one- to five-days out from all the providers. I think it is a fairly representative sample. Note the dips and peaks in the error graph. The error lines peak in the winter, and bottom out in the summer. The graph's y-axis starts at 3 degrees error to emphasize the difference, but even so, a winter temperature forecast has about 75%% more error on average than a summer temperature forecast. 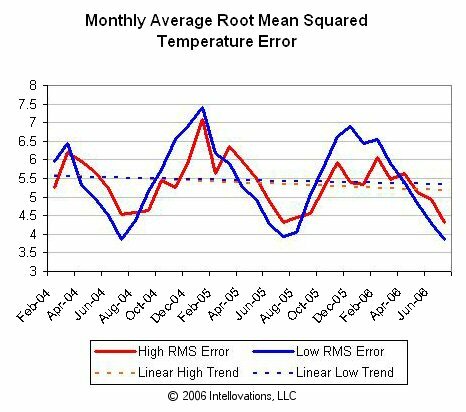 Just like Dr. Rose said, this past February was the worst month for error in 2006 so far, and the previous July had seen the least error before that. But why is it easier to forecast temperatures in the summer than in winter? For one, even in places like Key West, Florida, with some of the most unchanging weather in the continental U.S., there is more temperature variation in winter than in summer. The more temperatures fluctuate, the harder it is to predict.